The Baldwin Park Rotary Club and Orlando Breakfast Rotary Club are partnering together to bring you one of the most beneficial fundraisers in Central Florida on Friday, October 29, from 6 - 10 p.m. at the Varsity Club at the Citrus Bowl. This year marks the 14th anniversary of this annual beer tasting and charity auction with each year outdoing the last. Free, ample parking; an air-conditioned, open room filled with beer, food, and fabulous auction items; and great music provided by area musicians await those lucky enough to grab tickets to this fun-filled event - with 100% of the proceeds going to help kids at-risk, especially those at Orange Center Elementary School. For only $25, you will enjoy an evening of beer tastings from around the world paired with delicious delicacies from top area restaurants and caterers. 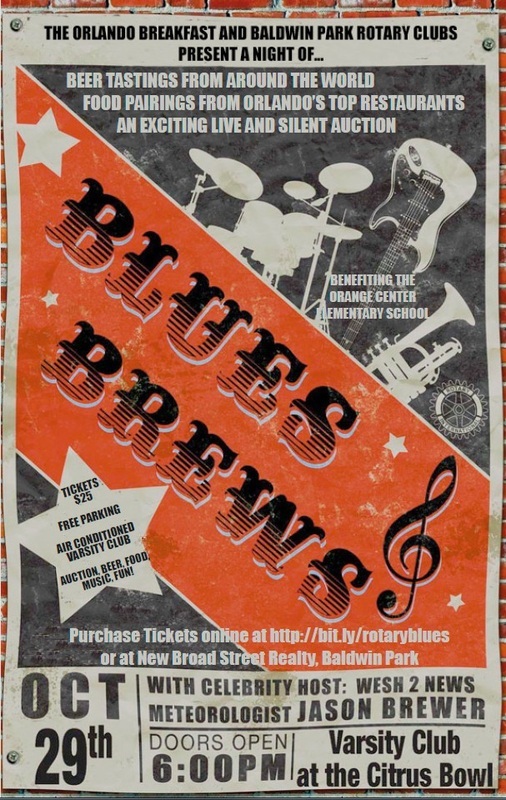 In addition to sampling a variety of "BREWS," you will enjoy different genres of "BLUES," featuring some of Orlando's great musicians. Our live and silent auctions will feature airline tickets, Magic memorabilia, recreation and attraction tickets, special and unique experiences, spa items, wine baskets, golf and vacation packages, restaurant certificates, and more. Also, once again, Jason Brewer, Wesh 2 News Meteorologist, will serve as our celebrity host. In addition to his passion for weather, Jason has a love of music and a heart for kids. Please contact Sarah Campbell (scampbell@newbroadstreet.com) at New Broad Realty to purchase tickets in person or buy them online by clicking below! Sponsorship opportunities available! Contact Reed Bloodworth for details at RotaryReed@yahoo.com. Click here for sponsorship, auction, or catering forms.